We hope you have a date. With your local Home Depot and/or Lowe’s store. To deliver their managers’ a “Give Bees Some Love” Valentine. Why? 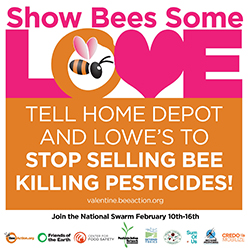 Because Home Depot and Lowe’s sell plants that are coated in pesticides that kill bees. And we need your help to convince them that what consumers really want, are healthy, sustainable garden plants that attract bees, not kill them. Next week, Feb. 10 through Feb. 16, the OCA will join 10 other national and international groups working together to convince the CEO of Home Depot, Frank Blake, and the CEO of Lowe’s, Robert Niblock, to stop selling plants that are coated in neonicotinoids—a class of pesticides linked to the die-off of honeybees, known as Colony Collapse Disorder. Our joint actions will include delivering hundreds of thousands of petition signatures, protesting at stores in at least five cities, and asking individual consumers, like you, to deliver a Valentine (provided by us) to your local Home Depot or Lowe’s store manager. How do we know Home Depot and Lowe’s are selling bee-killing plants? A recent study co-authored by the Friends of the Earth and Pesticide Research Institute found that seven out of 13 samples of garden plants purchased at top retailers—including Home Depot and Lowe’s—in Washington D.C., the San Francisco Bay Area and Minneapolis contain neonicotinoids. Colony Collapse Disorder is a Big Deal. That’s why, with the help of tens of thousands of consumers like you, belonging to organizations representing people from around the world, we’re going to keep up the pressure on Home Depot and Lowe’s until they stop selling plants that kill bees (and butterflies, too).